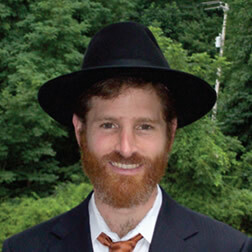 Rabbi Daniel Coren was Born & raised in Eretz Yisroel, Daniel’s soft-spoken humility & gentleness belie an underlying Sabra-like tenacity. Beneath his warm & gentle exterior is a lion of the spirit whose passion to ignite the spark inside a Jew has proven its skill in surmounting obstacles of every sort. Daniel was born to his special parents, R’ Mayer & Cina Coren, whose devotion to Eretz Yisroel & commitment to living in the Holy Land inspired Daniel from his youth. His early education was in religious Zionist Yeshivot in Israel. When he was twelve, the family relocated temporarily to the USA, where Daniel studied in Frisch & MTA. Then came a period of study in Kerem B’Yavneh in Israel, followed by Daniel’s return to the States to be with his parents. Melech. He then returned again to Yeshivas Ohr Reuvain & met his Aishes Chayil,Rachelle,the daughter of R’ Meir & Sheri Bernstein. R’ Meir is a talmid muvhak of Rav Gustman z”l. He & his wife transmitted their love & chashivus for Torah to their children. Daniel began to pursue outreach work as a result of a natural flair of working with people & drawing secular Jews close to their roots. With the encouragement of Rav Noach Weinberg z”l, Rosh HaYeshiva of Aish HaTorah, & also the support of Ohr Somayach,Daniel began his “partnering activity” matching up Jews with little or no Torah background with frum mentors skilled at teaching & inspiring. He specializes in partnering secular Jews as well as Yeshiva students with frum mentors & balabatim, in a concentrated learning program modeled on Partners in Torah. In a fitting tribute to Daniel’s dedication & Ahavas Yisroel, the system promises to promote the mutual growth & development of both students & mentors.